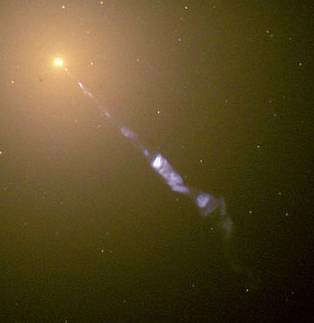 In addition if the visible star is close enough, it could give him part of its mass that would fall into the black hole being accelerated at such speed that it would reach a very high temperature such to emit x-rays. 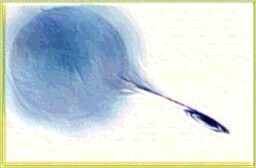 But this would also happens if it were a neutron star instead of a black hole. An example of a detected object that meets the two first conditions exposed is the binary star system called Cignus – X 1, which is a source of very intense x-ray formed by a visible star and another invisible star with a calculated mass exceeding 2.5 solar masses. It has been also detected objects of thousands of solar masses in the centers of galaxies, supermassive black hole candidates. Apart from this it must also take into account that S. Hawking deduced that a black hole would produce subatomic particles in their vicinity, losing mass and radiating such particles, which would be another way of detection. But we must not think that the hole would lose mass, because a black hole of a few solar masses would emit lower radiation than the cosmic background of the universe, receiving more energy that it would issue, and therefore increasing their mass eventually. In addition to observation of the movement of the stars to detect neighboring invisible stars with big mass that may be black holes, or by the radiation emitted by the accretion disks, we can also have tracks of black holes by the gravitational lens effect, because a black hole would divert the light of a nebula that is found behind, as it would occur quite visible figures in the form of arc or circle. 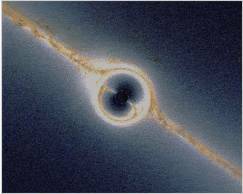 Simulation of how a galaxy behind a black hole would be.